Slashdot Story | Microsoft Is a Dying Consumer Brand < Shame to see Kinect flopping to be honest. Had high hopes. Windows 7 is seen as an expensive Windows Vista Service Pack. It doesn’t run well on older machines, it requires a lot of change in how people work and it still isn’t intuitive to use. I would even dare say it’s downright clunky compared to the age-old Windows way. People stay with Windows XP because it works well or they go to Mac or even Linux if they need to change anyway. Windows 7 is only a hit because it’s better than Vista and all computers in the last 4 years have come either with Vista or 7. But even so, most corporate users as well as a lot of home users still decide to downgrade to XP which most 7 licenses except for retail allows you to do. So actually the count for sold licenses is high but a bunch of them have downgraded again. XBox 360 is old and everybody has been waiting for the new one for at least 2 years now. Sure it sold a lot of consoles only because Sony was priced too high and Wii seemed downright juvenile. XBox 360 is cheap enough for most gamers older than 12 to get one but afaik the division has been making a loss ever since the inception. However the RROD, the issues with EA stopping to host older games and a bunch of other issues have given a lot of gamers no incentive to buy any further into the XBox (Kinect has flopped) and instead wait on the next generation. The only thing that keeps XBox sales up imho is Rock Band. 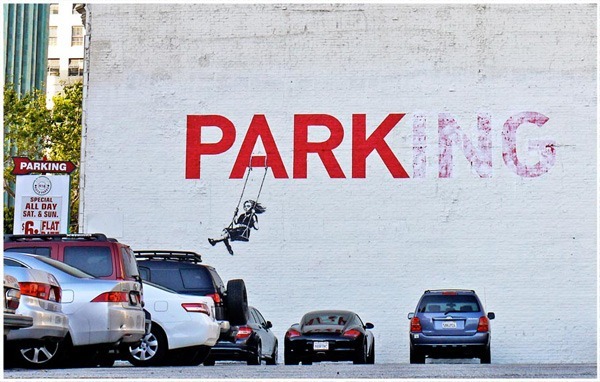 The Graffiti and Street Art of Banksy < Wow quite the nice collection of his work in this post. Will have to check out GoAnimate. However, I still think that Xtranormal has the meme advantage right now going for them. It’s not the same, though. The point that Ray Ozzie is trying to make is that, at some point, Microsoft needs to stop following the industry and become the one the industry follows again. Windows Phone 7 is great, but Apple was the one who popularized smart phones as we currently know them. Tablets are coming to the market with Microsoft software on them, but Apple was the one who popularized tablets. For years, before the iPod changed Apple, Apple made ends meet because they had a fervent fan base and catered to them. It didn’t hurt Apple that they were always playing catch up because they had total control over their environment. They made money on software and hardware. Microsoft is in the unique position of being a primarily software based company. If sales of Windows plummet, they don’t have that kind of closed system like Apple has to keep them chugging along. Additionally, Microsoft is such a huge company at this point, they have to be an industry innovator again or face crumbling apart. I agree that Microsoft is making waves to change their image. They’re the “cool” company (in the US) when it comes to videogame consoles and no one EVER saw that coming. Zune has its diehards (and rightfully so, the Zune HD is terrific hardware). Windows Phone 7 might get its following, that’s yet to be seen. And Windows 7 is just a pleasure to use, IMO. But the PC market is shrinking at a rapid pace and the only other market that MS is #1 in right now is videogame consoles…and that’s not the cash cow that Windows and Office are. Microsoft is literally sleeping on the chance to expand the xbox brand and make it the only box you need in your house for entertainment. Xbox SHOULD be the industry leader in iptv right now, but they’re not. And that’s a crying shame…because our other two players are Google (who’s going to eventually throw something free on the table and leave it to a hundred vendors to shape it into a usable product) or Sony (who’s going to try to tie everything into purchases and season passes, not true iptv) and I think that Microsoft, as a company that’s not tied to advertisement (Google) or owns huge assets of media (Sony) could shape this market in a way that’s good for consumers and runs off of hardware that’s already existing. It would also secure Microsoft’s spot as console leader for generations to come. Microsoft is sleeping on all sorts of opportunities now. Ray Ozzie, stating this as an insider, is really a doom and gloom statement from an investors standpoint.